Just as two weeks ago the market's confidence turned to dismay, this week its pessimism was steamrollered with a $400 leap in price. What can we expect from the week ahead? The main purpose of the market, said American investor Bernard Baruch, is to make fools of as many people as possible. That happened last week with traders' near-universal confidence that the rally to $7,400 would continue, and it apparently happened again as sentiment turned bearish across the board with the drop to $6,100. It's a tough time to be a bitcoiner, especially a new one, given the mixture of hope, dashed expectation and market manipulation we've seen in the last couple of weeks. Whether you were long or short, there were surprises, and there can't be many traders who called both the top and the bottom profitably. At this point, we'll zoom out to the daily, where the larger pattern becomes clear. Since mid-January, when a large proportion of the froth had come off the bitcoin market, BTC has been trading in a tightening wedge. The bottom of that wedge has been the $6,000 zone and just below. Bitcoin has descended to and come off that area no fewer than five times now. The upper bound of the wedge has fallen from $12,000 down to around $7,000. Bitcoin has risen to this level and then fallen four times. With each oscillation, the swings in price get smaller. If the pattern continues, it will run out of time in the last week of October, when the top and bottom lines cross at around the $6,500 mark. At that point, the price has to cross one or other line. Thus we have just five weeks before this stage in the market cycle finally resolves, one way or the other. But of course, it won't take five weeks. These things rarely go all the way to the end. Traders see the writing on the wall and collectively make a decision before that. 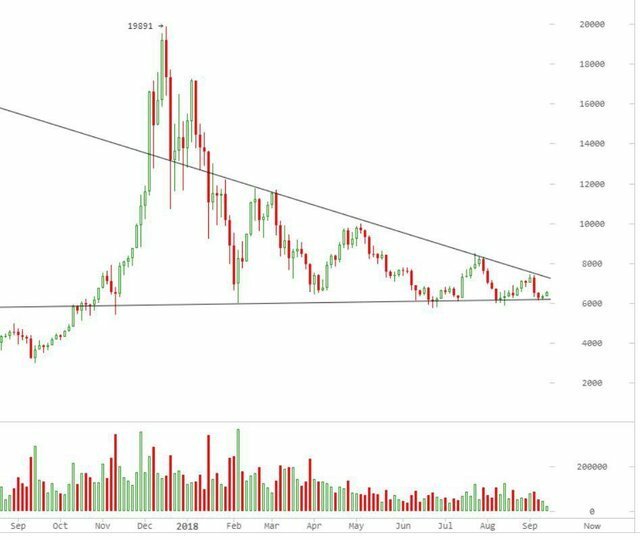 What we're looking for is a convincing movement above or below the bounds of that triangle (currently $7,300 and $6,300, respectively), with volume. Price may rise or dip outside of it briefly - if so, be cautious, because that doesn't mean it won't reverse and end up going the other direction. These 'fake-outs' are common. We'll only know for sure with hindsight, but look for the volume as well as the magnitude of the movement: together they indicate how committed traders are to the move. At the time of writing, RSI on the 4h reads almost 70, heading into overbought territory, but appears to be taking a pause and is possibly levelling off. On the daily, momentum is gaining upward pace but is not yet over the 50 mark, so there's plenty of room to go. The same returning optimism is not true of ETH, which has seen very heavy selling in recent days. Almost 300,000 ETH has been sold in the last month by ICOs dumping their holdings. Trustnodes reports that 160,000 ETH were sold in just 10 days. This has always been a risk for the Ethereum ecosystem, as critics have warned: it's one thing to collect tens of millions of dollars worth of ETH in your ICO, but at some point, you're going to have to cash out to pay bills. And if the market is crashing, you need to sell fast to make sure you have enough fiat to continue work. Then it just becomes a huge competition between ICOs to see who can cash out fastest and get the least-worst prices for their ETH. Right now it looks pretty bleak for ETH, though it saw a strong bounce from its recent low just yesterday. So the picture - at least for bitcoin - is looking up. Mike Novogratz, CEO of Galaxy Digital, just tweeted his opinion that the bottom is in. The next decision by the SEC on the SolidX-VanEck ETF is due at the end of September, which will prove significant one way or the other. But one last warning. That big Silk Road wallet that just sent a big chunk of coins to Bitfinex and likely sparked the last crash? There's plenty more where that came from. There seems to be many potential negative catalysts remaining unfortunately, mainly the ETF decisions. Hopefully the market has already factored a negative outcome in again.